I’ve shot video on the small group of tribal fishermen that work the beaches at the mouth of the Dungeness. They are out at dawn and often working hard to catch a few fish. It appears that this year will be a washout for them. The fish just aren’t returning in numbers large enough to warrant going out. Posted on August 10, 2015 by Al B. With the Dungeness River at historic low flows, this is going to be a most interesting year to see if WDFW and others like the Dungeness River Management Team can make this run successful. EVENT – Oct 2 – Sierra Club Meeting- Ron Eber speaks on the Wilderness Act 50 years on. Posted on October 2, 2014 by Al B.
October 2nd – You are invited to a potluck with the North Olympic Group of the Sierra Club to be held at the Trinity United Methodist Church, 100 North Blake Avenue in Sequim (next to Carrie Blake Park). Social hour begins at 5:30 PM. Please bring a potluck dish to share and it would be helpful to bring your own plate, cup, and table ware. Members and friends of the Sierra Club are invited. Ron Eber, Historian for the Oregon Chapter of the Sierra Club, will present a program on the Wilderness Act. On the 50th anniversary of the 1964 Wilderness Act, Ron’s talk will explore the work of John Muir and the pioneer conservationists of Washington who laid the foundation for all the wilderness we have protected since his time. Muir’s earlier wilderness and park campaigns will also be looked at to see what lessons we have learned and can continue to use in the future. Posted on April 4, 2014 by Al B. Sad, but expected. They likely will lose, as other suits have, and cost the State hundreds of thousands to defend. 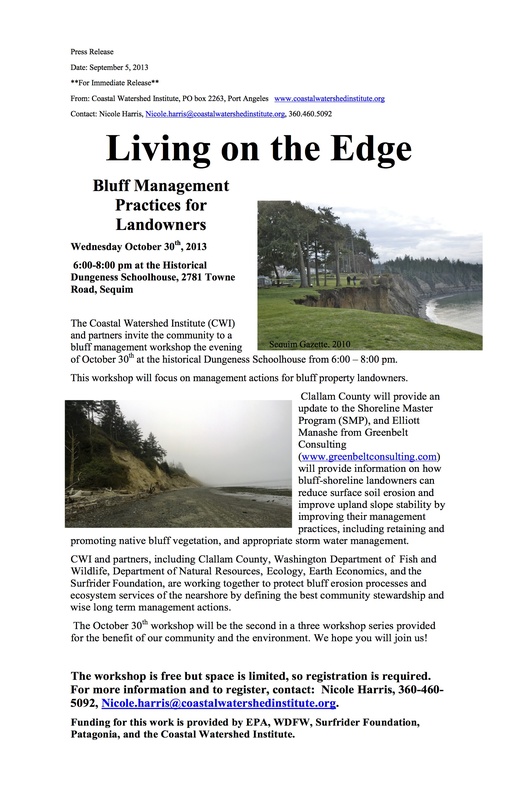 EVENT: Free workshop for homeowners on bluffs! Posted on October 28, 2013 by Al B. Given the recent bluff collapse in Port Townsend, this might be of interest to some of you!